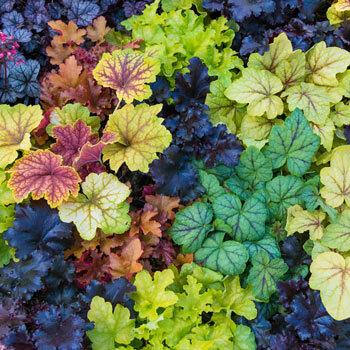 Our dynamic blend of hybrid heuchera is so beautiful and so easy to maintain, you'll wonder how you got along without it! The spikes of tiny bell-shaped flowers rise from tidy mounds of attractive foliage, which stays green all winter in warmer zones. This mix is tolerant of a wide range of soils. Also known as coral bells. Flower FormTiny bells on slender stems above the neat mounds of foliage. PruningRemove spent flower stems to tidy up plants for rest of growing season.